Extensive inventory of spare parts. Mainsail has 2 full battens and 2 part battens. Genoa was not used until 2016. 240 volt, 10 batteries charged by: engine, solar panels, generator Generator is 2007 Aqua Volt 240 V, 6.5 KVA. Solid GRP hull and Balsa cored deck. 3/4 Keel with skeg hung rudder. One of the berths in the aft cabin could be considered a honeymoon double. Two pilot berths in saloon. Portable A/C unit for use in port. Dual filtration system for water. Additional spare 5 Hp 2 stroke Tohatsu outboard. 1 x engine driven bilge pump. Based on the original Laurent Giles designed Carbineer sloop built by moody's in the UK, “Carbineer Yachts Australia” sent the design back to Laurent Giles and had the Carbineer 46 design altered to a true raised deck saloon Ketch. Built to a very high standard, production started in 1979, all the boats were made to order with the interiors tailored to suit individual owner’s requirements. Each Carbineer took about a year to construct and were reputedly the most expensive production yachts being built in Australia at the time. 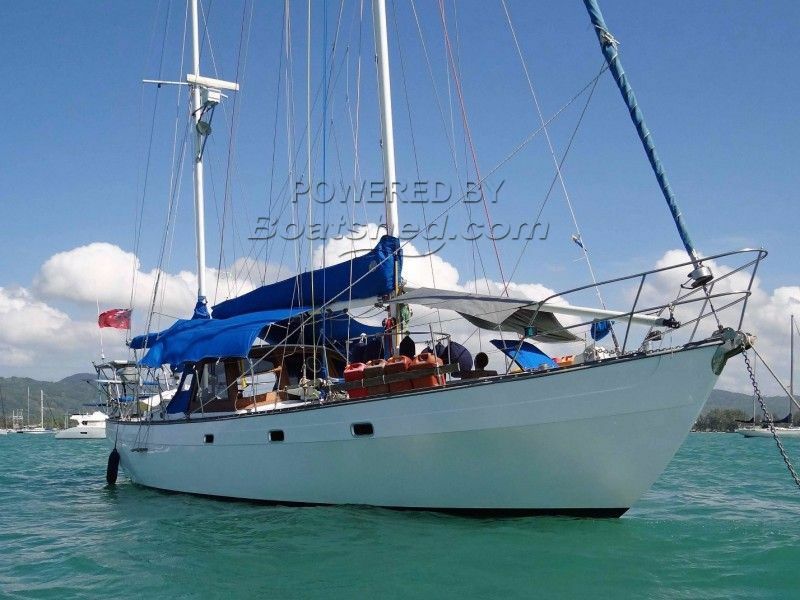 Large fuel & water capacity, 4 burner cook top, microwave / convection oven, big fridge & freezer in a galley designed to be practical at sea, twin helm stations and a pilot house that can be fully enclosed make her a great live aboard or long term cruiser. She was refitted in 2014 when the interior was refurbished, port holes changed, masts pulled and painted with awlgrip, hull painted with awlgrip and the underwater surfaces stripped back to the gelcoat, primed & repainted. ( owner says she was blister free ). Standing rigging was replaced in 2011 / 2012. A wife who has had enough of living the dream forces a reluctant sale of this safe, solid, pilot house, blue water cruiser. The old owner will step off leaving everything except a few personal effects & tools so that the new owner can step aboard equipped to go sailing. This Carbineer Yachts ( Australia ) 46 Pilot House Ketch has been personally photographed and viewed by Alan Giles of Boatshed Langkawi. Click here for contact details.